Each month, Big Brothers Big Sisters of Northeast Wisconsin shines a light on the relationships that we are helping build within our community. 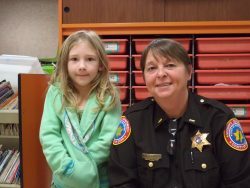 Please help us congratulate Big Sister Tammy Sternard of Forestville and her Little Sister Isabella of Sturgeon Bay — our Door County Match of the Month for November. Tammy Sternard: I first became aware of the program when my oldest son was a Little Brother through the BBBS program at Southern Door Elementary School. TS: Having our son in the program, we saw first-hand how the program was such a great opportunity for him. I was asked to be part of the Advisory Council for BBBS in Door County a couple of years ago. The Council started the Bigs with Badges program in Door County. I really wanted to be able to participate and get the chance to have an impact on a Little’s life. I believe strongly in law enforcement building strong relationships with our youth, and this program is definitely one that allows for this. Isabella: So I could spend time with somebody besides my brothers. TS: We are a Site-based match so we meet weekly at the school. We often times will play board games, put puzzles together, play cards or work on arts and crafts. We also will work on homework assignments on occasion when needed. If the opportunity comes up, we will go either in the gym or outside and play a game. I will also attend events at school when she can have a guest. TS: My little always makes me laugh; she has a really funny sense of humor. My best memory with my little would be when she asked me to be her guest at Grandparents day since her grandparents weren’t able to attend. As we were watching the concert, she said to me “Thanks Tammy for being my special person today, you could kind of be my grandparent because your old.” I just looked at her and laughed, but then realized I actually would be old enough to be her grandparent. I: Christmas – Tammy gave me a special Christmas ornament. It’s Belle, from Beauty and the Beast. And she’s carrying a purple book. TS: I enjoy spending each week with her and watching her grow into a great young lady. I always look forward to the different events I can attend with her through the year. I would say my favorite is the annual pizza party. At some point I would like to see if we could transition to Community-based to allow us to do more things in the community. I: Go to Bay Beach to spend the day together. TS: It’s my opportunity each week to just take a break from my busy life and just enjoy spending time with my Little doing various things. I started out thinking I would be her mentor, but I quickly realized I have learned just as much from her as I have taught her. It’s one of the things each week I look forward to. I: That she’s a sheriff. I think its cool. 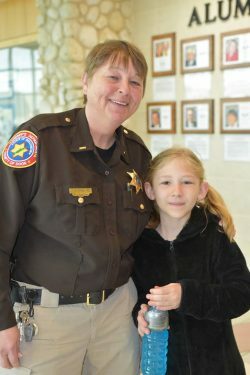 I might want to be a sheriff when I grow up. TS: When I signed up to be a Big I really didn’t know what to expect. After a couple of years being a Big looking back I can’t imagine not doing it. My entire family has embraced the program. We’ve went from having a son who was a Little to him being a Big in high school. Another son has signed up to be a Big this year as well. My own experience as a Big has given me a friendship with my Little that will last a lifetime. TS: Being a Big gives you an opportunity to change the life of not only the little but yours as well. It’s amazing how just an hour a week commitment can have such a positive effect on both of you. If you’re not sure, but interested, please reach out to the program coordinator and find out more about the program and how you can get involved. I will guarantee it is something you won’t regret doing. I: It’s made school more fun. School was boring before I got Tammy as my Big Sister.